Always Think Bigger: All done! 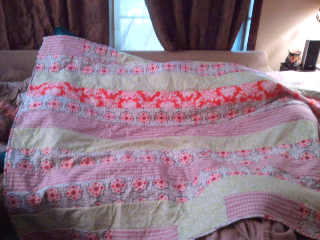 So, this afternoon I finished my first solo quilt! The kids were all quite excited to see it finished. I think we were all excited to see this massive project finishdd successfully. I can't wait to work on my next projects of matching shirts, dresses and pj pants for the kids! Happy to be sewing for sure!